Football helmet manufacturers continue to develop helmets to better protect the heads of young athletes. While helmets are an important part of the discussion of sport-related concussions, parents should not feel that newer helmets will absolutely prevent concussions in their kids. We must recognize a helmet can’t prevent concussions. Several studies in recent years have looked at the rates of concussions when players wore helmets made from different manufacturers. They have also analyzed different ages of the helmets and whether or not used helmets were reconditioned. They found no difference in the rate of concussion for players wearing helmets from different companies or from different purchase years. Researchers also found that helmet brand, age, and recondition status are not associated with a lower risk of concussions in high school football players. One fundamental challenge with newer helmet technology is that football helmets are designed to limit the force of impact on the head. They attempt to spread out the force of a blow to the head. In theory less force is delivered to the skull and brain tissue, and the risk of skull fracture and intracranial bleeds decreases. The idea that any helmet could ever completely eliminate the risk of concussion in football is ridiculous. 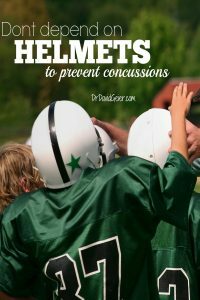 The nature of the repetitive subconcussive blows and the whiplash effect that causes the brain to slam into the skull when a kid is hit in the body would seem almost impossible for any helmet to prevent. Since the helmet itself might have little effect on the incidence of concussions, parents should talk to their kids about the dangers of concussions instead of spending an extra $100 or $200 on fancier helmets. We know that athletes in team sports often deny to their teams’ medical staffs that they are having concussions in order to stay on the field. That attitude exists at all levels of sports, including high school. Parents must emphasize the importance of being honest about concussion symptoms. Teams can shift attention from newer helmet technology to instituting baseline concussion testing for each player at the start of the season. Doctors, athletic trainers and coaches can also push parents to have their concussed children undergo neurologic testing if he suffers a concussion. And we must stop rushing to get players back in the game at the expense of the long-term health of the athletes. Research to make better and more protective helmets is always going to be important. Parents, though, should not rely on the helmets alone to prevent concussions in their children.